South of Rome, about 3 kilometers north of Roma Vecchia, Marcia (with Tepula's and Julia's specus on top) made a wide loop and intersected Claudia - Anio Vetus twice. The area enclosed by the loop was used by the Goths in 537 - 538 A.D. during their siege of Rome. They filled in the arches and put in 7,000 troops in the fortified camp. From this event the place came to be known as Campus Barbaricus. The tower in the foreground of this crossing pretends to be Tor Fiscale built in 1363 A.D. as a papal tax collector. The tower still has remains of the specus of the five aqueducts. This representation is hypothetical, because when the tower was built, major remains of the aqueducts were already broken down. 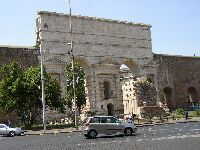 The Porta Maggiore originally was a double ornamental archway where the Aquae Claudia and Anio Novus crossed the ancient Via Praenestina and the Via Labicana (now Casilina). During the construction of the Aurelian Wall (finished in AD 279 under Probius) it was turned into a double gate in this defensive wall. Note the distinct levels of the Acqua Felice (right and left) and the Aquae Claudia and the Anio Novus above both archways. The Porta Maggiore bears three inscriptions (just like the Porta Tiburtina). The first one (CIL 6.1256) states that Claudius built the aqueduct(s). Both Vespasian and Titus paid for the necessary repairs (both other inscriptions: CIL 6.1257 and 6.1258). At right the tomb of the baker Vergilius Eurysaces. This cylindrical castellum is 3.69m tall and about 3m in diameter and related to the Aquae Marcia, Tepula or Julia. Ashby states that "...the structure is not traversed by a specus at their level, which could only have been reached by a siphon". He proposed that the water was accessed with buckets. It is the only surviving relic of the water distribution system for the Viminal and can be found close to the Stazione Termini of Rome. For more photo's on the aqueducts of Rome see Aquasite. The extension from the Arcus Neroniani to the Palatine: a look up to the Palatine slope from these arches makes it obvious that the arches as they stand were not nearly high enough to deliver water to the top of the hill. Several hypotheses attempt to explain what the original structure must have looked like to accomplish this. Asby supposes that the present two-tiered structure formed a base for an inverted siphon. More widely accepted is the theory that the original arcade was twice as high and consisted of two further tiers of arches on top of the remaining two (after Aicher 1995). It is generally agreed that the city of ancient Rome had eleven major aqueducts - for short desciptions, see below - built between 312 BC and AD 226 and possibly a few minor aqueducts, probably between eight and twelve in number, see elsewhere. The evidence for the majority of the minor aqueducts is not substantial, and they must perhaps remain little mysteries. The first major aqueduct was built in 312 BC and the last around 200 AD. Some of the aqueducts outlasted the Empire and remained in use well into the middle ages; parts are still in use, see later history. The quantity of water carried by the aqueducts is one of Rome's most impressive achievements. Now there were, in the aggregate, 12,755 quinariae set down in the records, but 14,018 quinariae actually delivered; that is, 1,263 more quinariae were reported as delivered than were reckoned as received. Accordingly, I first undertook measurements of the intakes of the conduits and discovered a total supply far greater - that is, by about 10,000 quinariae - than I found in the records. There are another two complications. Firstly, about one third of the water was actually distributed outside Rome (Evans, 1997:140). There are also problems with Frontinus' techniques of measurement. However, more importantly, water theft was rampant. Often small-gauge offtakes would be inserted into main pipes and conduits to steal water. Often these were not well-installed, and severe damage to the main pipe or conduit resulted. For example, placing the offtake in loosely might result in a leak, or the expulsion of the offtake pipe due to pressure. Too many offtakes in close proximity might result in the main pipe or conduit collapsing. Frontinus states that they may be 'ripped apart'. These two complications make an already complex task more difficult. We must satisfy ourselves with the estimates we have, and try to improve them if new information or insight arises. The combined Claudia/Anio Novus aqueduct distributed water through all fourteen regions of Rome. However, by referring to the table below we can see that the earlier lines were also important. The Appia's low volume and elevation prevented its widespread distribution. The Marcia was distributed more widely than the Anio Vetus. The Virgo brought enormous volumes, but only to three regions. The Tepula and Julia, reworked by Agrippa, was quite widely distributed, having 31 'castella' between them (Evans, 1997:139). Looking at the table, we can see that the aqueducts together catered for all fourteen regions in Rome. It does not appear as if any master plan was followed to achieve this, but rather a policy of building a new aqueduct when necessary, and distributing water where needed. While this is a flexible approach, it requires strong central authority and considerable financial outlay to achieve. Traiana 109 ad - 55 - ? ? ? ? ? ? ? ? ? ? ? ? ? ? ? Alexandrina 226 ad - 22 2.4 ? ? ? ? ? ? ? ? ? ? ? ? ? ? ? Built in 312 B.C. by Appius Claudius Crassus, builder of the Appian Way. Length: 10 1/3 miles, all underground except for a short distance inside Rome. Source: Probably some springs above Via Collatina, about eight or nine kilometres east of Rome. Terminus: Along the Tiber near wharves where the salt warehouses (salinae) were situated. Features: Of low elevation; made of cut-stone blocks. There are no visible remains. Begun in 272 and completed in 269 B.C. by a board of men appointed by the Senate. Length: 39 1/2 miles, virtually all underground. Source: The Anio (Aniene) River near Vicovaro. Terminus: Details are lacking, but the water was widely distributed inside Rome. Features: Of low elevation; made of cut stone. There are no conspicuous remains of the original work, but there are some fine bridges, notably Ponte S. Gregorio and Ponte Taulella, that belong to later periods. Built in 144-140 B.C. by Quintus Marcius Rex. Length: 56! miles, of which 88 per cent, or almost 50 miles, was underground and the rest on arches, mostly near Rome. Source (or farthest known remains): Channel near the village of Morano, north of Subiaco; the springs on which it fed were near this place. 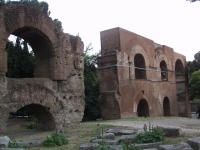 Terminus: The first terminus was on Capitol Hill, but over the centuries branches were extended to the Caelian, Aventine, and Quirinal, to the Baths of Caracalla and Diocletian, and to the Forum of Trajan. Features: This was Rome's first high-level aque-duct, and the last to be made entirely of cut-stone. It supplied the best water and was pre-eminent in other ways. Many above-ground remains still exist, though much was incorporated in and hidden by the sixteenth century aqueduct, Acqua Felice. The most prominent remains of arcades and arches are at Porta Furba, Tor Fiscale, Roma Vecchia, and Valle degli Arci. Some fine bridges of the Marcia still remaining are Ponte Lupo, Ponte S. Pietro, Ponte della Bulica, and a bridge in Fosso di Caipoli. The principal remains associated with the Marcia inside Rome are the Arch of Dolabella and Silanus on the Caelian; the Augustan bull's head arch over Via Tiburtina at Porta S. Lorenzo; and some conspicuous parts of the channel at Porta Maggiore. Built in 125 B.C. and called tepula' because the water was tepid. Length: 11 miles; for the last 6 miles into Rome, the channel of the Tepula rode on top of the arch-supported channel of the Marcia. Source: Springs at the foot of the Alban Hills west of Grottaferrata. 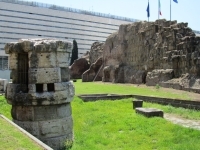 Terminus: The original terminus appears to have been near ancient Porta Viminalis which was located in the Republican Wall near the site of modern Rome's central railway station. Features: There are some remnants of the channel, notably at Roma Vecchia and Tor Fiscale; inside Rome, the channel may be seen at Porta Maggiore and in the Augustan arch over Via Tiburtina, at Porta S. Lorenzo. Built in 33 B.C. (or 40 B.C., according to Dio Cassius, a Roman histotian who lived c, I55 - 235, see Roman History, xlviii, 32) by Marcus Agrippa and named for his patron and future father-in-law, Gaius Julius Caesar Octavianus, who was then consul, but was later to become emperor with the title of Augustus. Length: 14 1/4 miles, of which about 7 1/3 miles, or 51 %, was underground and the rest on arches; for the last 6 miles into Rome, the channel of Aqua Julia rode on top of the channel of Aqua Tepula, which rode on the Marcia. Source: Springs near the bridge of Squarciarelli, east of Grottaferrata. Terminus: The water of Aqua Julia was distributed in the region of, but not to the top of, the Caelian, Aventine, and Palatine hills. Features: There are some much-battered remains of the channel at Roma Vecchia, Tor Fiscale, Porta Maggiore, and at the gate over Via Tiburtina in Rome. The most conspicuous ruin belonging to the Aqua Julia is the Julia Fountain in Piazza Vittorio Emanuele near the central railway station in Rome. Built in 19 B.C. by Marcus Agrippa to supply water to the baths he was building on the Campus Martius near the site of the Pantheon. It was named 'Virgo', the Virgin, because a young girl found the source, some fine springs, now to be identified as being near the railway station of Salone, above the eleventh kilometre of Via Collatina. Length: Including its tributaries, the Virgo was 14 1/4 miles long, of which about 7 4/5 miles, or 55 %, was underground and the rest on arches. Terminus: Baths of Agrippa on the Campus Martius. Features: There are virtually no visible remains of ancient Aqua Virgo outside Rome. There are some remains inside the city, the most notable of which is a half-buried monumental arch on Via del Nazareno, built by Claudius when he rebuilt the Virgo. Modern Acqua Vergine, which supplies water to Trevi Fountain and other places in the neighbourhood, is related to ancient Aqua Virgo mainly in name. Although Acqua Vergine may use some of the ancient channel of Aqua Virgo, its source is not the original springs but springs nearer Rome. Built in 2 B.C. by Augustus to supply water to his naumaclia, an artificial lake on the Janiculum where mock naval battles were staged. Length: 20 2/5 miles, virtually all underground or on low substructions. Source: Lake Alsietina (now Lake Martignano), for which it was named. This lake is north-west of Rome. Aqua Alsietina was one of two aqueducts - the other being Aqua Trajana - that entered Rome on the west side. The Alsietina, and also much of Aqua Trajana, was destroyed early in the seventeenth century in the building of a new aqueduct, Acqua Paola. Features: There are no visible remains of importance belonging to the original Alsietina. This aqueduct gave Rome its poorest water, was the lowest in elevation, and always had a bad reputation. Begun by Caligula in A. D. 38 and finished by Claudius - for whom it was named - in 52, together with Aqua Anio Novus (see below). Length: 43 1/3 miles, of which almost 34 miles, or 78 %, was underground. Of the 9 1/2 miles on arches, almost 3 miles were far out in the country, and the remaining 6 1/2 miles were near Rome. Source: Springs north of Subiaco, above those of Aqua Marcia, exact location unknown. Terminus: The Claudia was widely distributed inside Rome, notably on an arcade built by Nero to take the water to the top of the Caelian and, eventually, to the Palatine. Features: There are many remains of the Claudian arcades, notably at Roma Vecchia, Tor Fiscale, Porta Furba, and between Porta Furba and Rome. And there are fine remains of a branch aqueduct carried on high arches from near Roma Vecchia to the Villa of the Quintilii. Porta Maggiore at Rome was built to carry the channels of Claudia and Anio Novus in grand style over Via Prenestina and Via Labicana (Via Casilina). Some notable bridges of the Claudia are located in Fosso della Vallana, Fosso della Noce, and at Fonte Luca. Inside Rome the most conspicuous remains of the Claudia, besides Porta Maggiore, belong to Nero's arcade, as along Via Statilia, inside Villa Wolkonsky (grounds of the British Embassy), on Via di S. Stefano Rotondo, and especially on the slopes of the Palatine above Via di S. Gregorio. Begun in A.D. 38, together with Aqua Claudia, by Caligula and finished in 52 by Claudius. It was named Anio'' because it took its water from the Anio River, and Novus'' was added to distinguish it from the Anio of 269 B.c., henceforth called Old Anio. Length: 54 miles, of which 45 1/3 miles, or 84 %, was underground. Of the 8 2/3 miles on arches, a little more than two miles were far out in the country, and 6 1/2 miles were near Rome; for the last 6 1/2 miles into Rome the channel of Anio Novus rode on top of the channel and arches of Claudia. Source: Artificial lakes in the Anio River, near Subiaco. Terminus: Reservoir near Porta Maggiore, but little is known about the distribution system of the Anio Novus, apart from that of the Claudia, inside the city. Features: Some of the most beautiful remains of any of the aqueducts belong to Anio Novus, all in the country, such as the arcades at Valle d'Empiglione and Valle degli Arci, east of Tivoli. There are impressive bridges at Valle d'Empiglione. Ponte S. Antonio, Ponte dell'Inferno, Ponte Scalino, and Ponte Barucelli, also belong to Anio Novus. There are no important remains of Anio Novus at Rome, except at Porta Maggiore. There is a branch of the Anio Novus, now represented by badly worn arches, from near Roma Vecchia to the Villa of Sette Bassi. Built in A.D. 109 by Trajan. Length: 35 2/5 miles, of which the major portion was underground. Source: Springs on the west side of Lake Bracciano (ancient Lacus Sabatinus), north-west of Rome. Terminus: Reservoir on the Janiculum, in the neighbourhood of present Villa Spada. Features: Much of the Trajana, as well as virtually all of the Alsietina, was destroyed early in the seventeenth century when Acqua Paola was built from materials from these two ancient aqueducts. There are some fine remains of Aqua Trajana along Via Aurelia Antica near the grounds of Villa Doria-Pamphili, not far outside Porta S. Pancrazio. Built in A.D. 226 by Alexander Severus to supply his baths with water, and named for the emperor. Length: No ancient record exists of the length of Aqua Alexandrina, but modern calculations indicate that it was about 22 kilometres, or 13 2/3 miles long. Source: Springs in the basin of the Pantano (marsh), south of Via Prenestina, 14 miles east of Rome. Terminus: New baths called Thermae Alexandrianae, a rebuilding by Alexander Severus of Nero's Thermae Neronianae, on the Campus Martius near the Pantheon. Features: Aqua Alexandrina has left no visible, or known, remains inside Rome, but there are fine arcades, or parts of arcades, at Centocelle and several other places in the country east of Centocelle. Besides the eleven aqueducts of antiquity, there are three aqueducts - one built in the sixteenth century, one in the seventeenth, and one in the nineteenth - that are related to three of the ancient systems. This aqueduct, still in use, was built by Pope Sixtus V (Felice Peretti) in 1583-1587, and named for him. It was built on the arches of Aqua Marcia and, to a lesser extent, on the arches of Aqua Claudia. Acqua Felice runs for about fifteen miles underground and seven miles above ground; that is, above ground from the point near Roma Vecchia where it begins to emerge among the ruins of Aqua Marcia and soon climbs on top of the Marcia arcade. lts springs are not those of the ancient Marcia (these are used by Acqua Marcia-Pia; see below), but those of Aqua Alexandrina. lts ugly form is a conspicuous feature of the campagna east of Rome, and its parasitic association with Aqua Marcia is particularly conspicuous from Roma Vecchia to Porta Maggiore. Fittingly enough, the main terminal fountain of Acqua Felice is no doubt Rome's ugliest piece of statuary. It is the Fontanone dell' Acqua Felice, with a Moses so badly executed that its sculptor is said to have ended his life in mortification. Built in 1611 by Pope Paul V (1605-1621), after whom it was named. Almost all of the remains of Aqua Alsietina and much of the stonework of Aqua Trajana were used in building Acqua Paola, or were destroyed in the process. Acqua Paola closely follows the channel of the Trajana. lts water comes both from Lake Bracciano and from the springs on the west side of this lake from which Aqua Trajana drew its supply. Acqua Paola supplies water to areas on the Janiculum. Fontana Paolina, also built by Paul V, and Rome's most volumineus fountain, is the main terminal point of Acqua Paola. This modern aqueduct, completed in 1870, was named in honour of both the ancient Marcia, whose springs it uses, and Pope Pius IX, in whose reign it was built. It is still one of modern Rome's chief sources of water- except on occasion, usually during the August vacation, when some apartment house managers cut down the supply to a tooth-brush trickle. The source of its water is this aqueduct's only relation to the ancient Marcia, but it is a more pleasing relationship than that between Acqua Felice and Aqua Marcia, since Acqua Felice is related to its ancient better only by virtue of having used, and ruined, the fine old arcades.